Dar es Salaam's Rapid Bus System. Bus rapid transit systems (BRT) have become the fashionable solution to chronic traffic congestion and low quality public transport - endemic problems for many cities in developing countries. BRTs typically operate using dedicated bus lanes, while passengers pay their fares before boarding. The number of BRTs is growing rapidly across the world: from 40 in 2007 to 170 in 2019 - and there are many more in the pipeline. It's also regularly said that BRT fares can match those of pre-existing minibus operators, and that BRT buses cause less pollution. Such arguments fuel claims that BRT systems represent a "win-win" solution to public transport woes, benefiting the economy, the environment and the poor all at once. But there's evidence to show that BRT proponents promise more than they can deliver, especially for society's most vulnerable. But while some groups do indeed benefit, this rosy outlook obscures the fact that some people are left worse off. Take the issue of fares, for example. 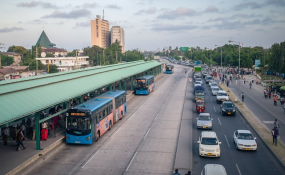 Though DART officials pledged that BRT fares would be comparable to those of the daladalas - the minibuses which provided the cheapest form of public transport in Dar es Salaam before BRT - today, DART fares cost on average 55% more. This fare inflation is common to BRTs elsewhere in the world, and was even the cause of violent protests in Bogotá, in Colombia. Despite investments of US$150m for the first phase of BRT, the poor are still stuck in traffic on cheaper buses every day. By contrast, those who are wealthy enough to afford the higher fare have the option of cutting travelling time by two hours a day. Roughly 70% of Tanzanians live on less than 4,400 Tanzanian shillings a day, (that's less than US$2). Yet a two-way commute along the main branch of the BRT would cost 1,300 shillings - that's a staggering 30% of poor people's daily income being spent on transport. By comparison, the same commute by daladala would have cost 800 shillings. What's more, the lack of jobs is a major problem in Dar es Salaam, as in many other metropolises in developing countries. Since BRT buses can carry more passengers than minibuses, about ten daladalas will be displaced by each BRT bus. This will have devastating consequences for the 20,000 to 30,000 people employed in public transport. There are currently no plans to address the fate of these workers. BRT advocates commonly praise it as a financially self-sufficient bus transport system. But BRT in Dar es Salaam, as elsewhere in the world, is not sustainable without public subsidies - even with its current high fares. Whether or not the Tanzanian government is willing to subsidise the system remains to be seen. But in a country with very limited public resources, doing so would divert funding from other vital development needs. If such organisations are evangelical about the benefits of BRT, and silent about their shortcomings, it could be because it's in their financial interests to see new systems implemented around the world. But public transport should be designed with the interests of cities' most vulnerable residents at heart; especially those who cannot afford higher fares, or stand to lose their livelihoods when current systems are reformed.